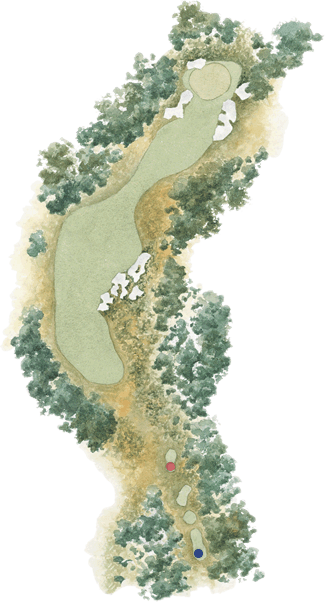 The sixth hole is one of the great two-shot holes, a wonderful example of how to perfectly position a ground hazard on the inside corner of a dogleg. The tee shot is played over a magnificent expanse of heath and sand. The player must then make a decision whether to attempt to carry over the bunkers at the corner of the dogleg, or to opt for discretion and hit further to the left. A long drive over the bunkers to the far edge of the fairway leaves a difficult second shot over one of the most awkward greenside bunkers on the course.